We are accredited with full disclosures and safety certifications for all types of works including Gas Safe and OFTEC registration. Our experience covers fields including Green Deal and Warmworks. Boiler replacements can be carried out under the Warmworks scheme through which £240m has been injected by the Scottish Government to tackle fuel poverty. 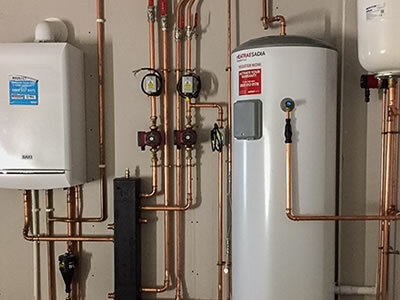 New build boiler, hot water and underfloor heating installation. 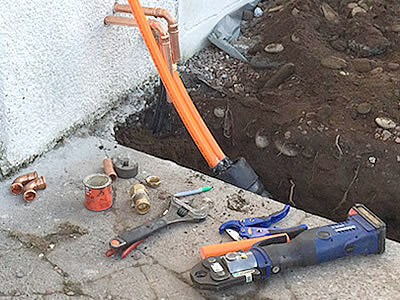 Biomass insulated underground pipework to house..
RJ McCulloch fitted a new air source heat pump in our home, swapping from an LPG boiler and using our exsisting underfloor heating system. The team were very clean workers, removing all the old bits without being asked, and they had all the right tools to hand. More to the point, when Ross came across problems in blending in the new system with the elements already there he was very helpful in finding economic solutions quickly. My background is engineering so I was pleasantly surprised that he really knew what he was doing, unlike a lot of plumbers who just talk a good job. I can already see the cost savings using the Mitsubishi Ecodan unit over our LPG system, which was not that old and used a modern and already very efficent unit. Ross also helped with all the paperwork for the RHI so making a claim was very simple.